It's that time again folks...and the WIPs are sadly lacking this go 'round. Sorry...I don't even have any. I didn't get anything done last week since I was attending a destination wedding. But, Cornelia...bless her heart, had sent me this little nugget before I left, for me to share with y'all! This one has an interesting story..... A few months ago I was thinning out my fabric stash. I pulled eight or nine FQs and larger scraps (new fabric and old shirts, sheets, etc) that I just didn't think I'd ever use. But as it would happen, when I saw these all together, I thought they actually looked kinda neat together! So I quickly cut them into 4" tumblers and stuck them away for another time. 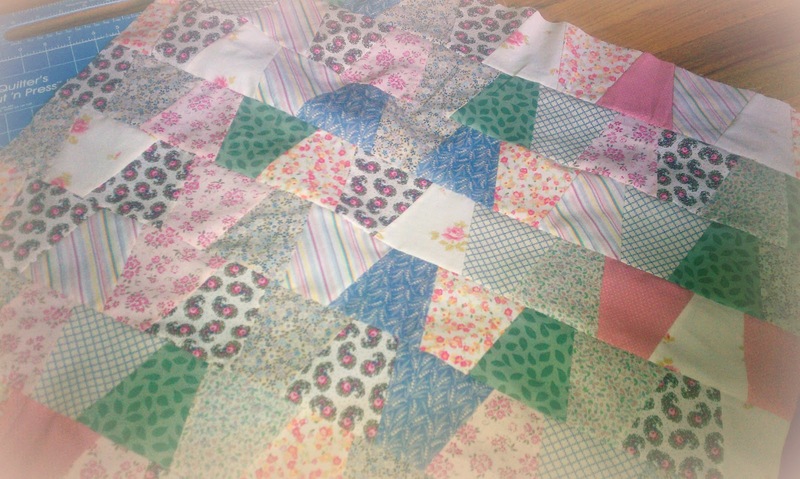 Last week a friend had a little girl and I was able to churn out a top in no time because my cutting was done. I still have to add some borders to plump this up some. Looking good, girl! It has a sweet vintage feel that I'm loving. And thanks for helping us out with WIP Wednesday this week. Now, I'm off to work on some of my own projects and play catch up a bit. And if you're a member of OKCMQG or are interested in becoming one...don't forget to come to our meeting this Saturday, 1:00, at Quiltworks in OKC! :) I look forward to seeing everyone!